Dr. Frayn listens to your needs. No two people are exactly alike. 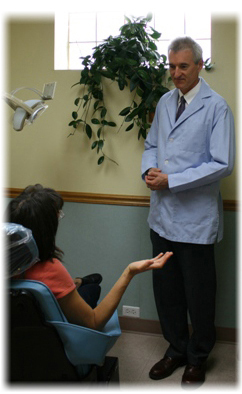 So at Precision Dental Arts, our philosophy is to focus on your unique oral care needs, whether simple or complex. We start with wherever you are at: hear your dental needs and wants. Base any treatment decisions on a through dental exam, other appropriate information and an understanding of your goals. Recommend the most conservative treatments with longevity and esthetics in mind, along with other alternative treatments to consider. Provide your treatments in a caring, respectful environment with sufficient time allotted for quality, and long-lasting results. Help you maintain great dental health and your best smile for the rest of your life. Taking complex dental conditions caused by excessive tooth wear, multiple missing teeth, shifting teeth, and poor smile appearance to health, beauty, comfort and longevity.